1 Burning Question – Can the Bearcats’ defense take them to the next level? The second biggest question with Cincinnati is, “Can Gunner Kiel stay healthy?” That’s a fine question, and a pretty important one when one peruses the Bearcats’ quarterback roster. However, the question so burning that it had to be the leader concerns the defense. Seven times the Bearcats’ defense gave up 30 points last season. Cincinnati was able to push to a 4-3 record behind a high-flying offense. A couple of the wins went right down to the wire with East Carolina and Houston. The Bearcats’ defense was gashed by UC’s three best opponents (Ohio State, Memphis and Miami) for over 600 yards, and those teams ran for 300 yards in each game. Technically Memphis was at 299, but the larger point is that the Cincinnati defense could not hang with the big boys. Some of this was because of a pretty young unit. Some of this was because of a new defensive coordinator and new aches and pains that come with the scheme adjustment. Change is definitely coming to the defense, though. Linebackers Jeff Luc and four- year staple Nick Temple depart, as well as sack specialist Terrell Hartsfield, leaving a huge hole. With a lot of extra attention heaped on him, Silverberry Mouhon went from 12.5 tackles for loss and 9.5 sacks to just 5 and 4. Getting Mouhon back on track should help what will be a new-look front seven. On the back end, junior Zach Edwards has performed like one of the better safeties in the league his first two years. 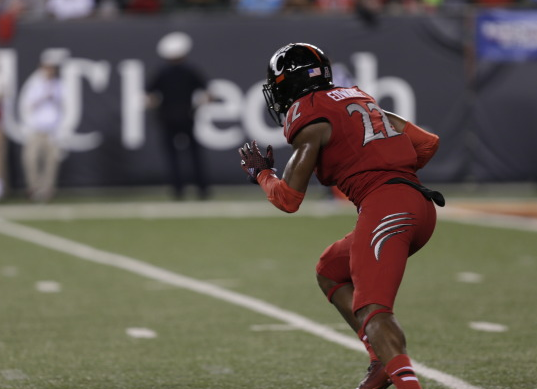 With the Bearcats having to play a lot of youngsters in the secondary due to injury, one would hope returning experience would shape things up. 3,435 – the yardage of Cincinnati’s top 7 returning receivers in 2014. The offensive fireworks displayed by the Bearcats’ passing game last season cannot be understated. While Gunner Kiel played and started all 13 games, he only made it through about 10 unscathed. He still put up over 3,200 yards and 31 touchdowns. 33 of the 35 receiving touchdowns by the Bearcats are coming back. “Big-play” Mekale McKay wasn’t even the most high profile deep threat, Chris Moore averaged over 22 yards a reception to go with 8 touchdowns. It’s taken this many words to mention Shaq Washington, the slot receiver who hauled in 66 passes. 8 – the touchdowns rushed for by Mike Boone in a six-game span. Mike Boone stepped up as Cincinnati’s feature back out of sheer necessity. Tion Green suffered a season-ending injury, Hosey Williams had some legal trouble, and Rod Moore wasn’t an every-down back. Boone didn’t play until the fifth game and didn’t get significant carries until the seventh game of 2014. In that game he ran for 212 yards. Boone’s breakout gave UC some different looks with the offense and helped it to not look so one-dimensional. With the threat of the pass, Boone had lanes to run wild. He was primarily in a timeshare last season and probably will be for the most part this year, but it’s only a matter of time before he’s the man standing next to Kiel long term. Why it Matters: These are considered the best teams in The American. Memphis won at Cincinnati in dominating fashion to get themselves on the path to the league title. Cincinnati won a share of the league as well. This season, we don’t really have to worry about shared league titles because there is a championship game. This contest will go a long way toward determining who could be hosting the first AAC title game. Memphis and Cincinnati are in opposite divisions. The winner of this game should be in prime position to host the title game and a probable rematch. Why It Matters: The trip to Provo caps a three-game stretch against the sexiest opponents on Cincinnati’s schedule: Memphis, Miami and BYU. This game could be hugely important for the Bearcats in terms of national rank and positioning amongst the Group of Five. With only one spot, this three-game stretch of ESPN showcases could give the Bearcats the exposure they desperately need to make themselves stand out. The important thing here would be winning all three. This looks like the toughest game of the season for Cincinnati on paper, mainly because of the unfamiliarity, the long trip, and stepping into a place where the Bearcats have never played. Why It Matters: One opponent from the AAC East had to be mentioned, and for this (un)biased observer, it’s Central Florida. The Knights have won the AAC outright in the league’s first year, and were the third team to share the crown last season. Winning a third title would mean going through Cincinnati. This could end up being the rivalry that Connecticut wishes it was going to have. Both programs have a lot of talent and solid coaching, and should put on a hell of a show. In the most important part, both should be setting themselves up to win the East Division. Gunner Kiel, QB – It’s hard writing about Cincinnati without mentioning the most famous Bearcat. Kiel threw for 3,254 yards and 31 touchdowns last season, while completing nearly 60% of his passes. There was also a propensity to take off on the ground with some success. Even while battling rib injuries, Kiel tied the Cincinnati record for touchdown passes in a season. The players are there around him for Kiel to destroy it. Zach Edwards, S – As mentioned previously, Edwards is the highlight of the Bearcats’ returning defense. He recorded 121 tackles a season ago, which was second on the team. Edwards tied for the team lead with 2 interceptions and was second on the team in passes broken up and forced fumbles. There wasn’t anything he couldn’t, or didn’t, do. As a third-year starter, Edwards should evolve into a dynamo safety. Parker Ehinger, OL – Ehinger is one of the Bearcats’ rocks on the offensive line. He’s started each of the last two seasons and has been honored by various outlets for his stellar play. It’s clear that Ehinger is the Bearcats’ best lineman and should be a first-team All-AAC selection at year’s end. Shaq Washington, WR – There are players that do a little bit of everything, as well as one thing extremely well. Shaq Washington is that player on the Cincinnati Bearcats. Washington has led the team in receptions each of the last two seasons. Out of the slot, he’s a consistent third-down target. It seemed like 40 of his 66 receptions in 2014 came on third down. (That’s unofficial, but the point is that he was a reliable third-down playmaker.) Washington also returns punts. He averaged 6 yards a pop, but did break a couple of long returns. On top of that, Shaq also played some wildcat quarterback. He’s thrown passes in each of the last two seasons. He does it all. 5. Gunner Kiel will shatter many Cincinnati single-season records. This is not exactly walking out on the longest limb since Kiel was close to shattering many last season, even with injury trouble. A fully healthy Kiel with all the weapons he has at his disposal should put up some video game numbers. I’m not even sure if that should be a phrase anymore, with how much passing has dominated college football. I’ll say this instead: Kiel will put up Mike Leach numbers since those are crazier than a video game. 4. UC will have multiple 200 yard receiving games. Okay, this one is very bold. Chris Moore went for 221 against Ohio State last season. Mekale McKay went for 175 and 172. I’m banking on the Alabama A&M Nippert Stadium-reopening season kickoff to be a bludgeoning in which UC gets stats. I have a feeling there will be some shootouts somewhere, which will allow for the second huge game. Hey, go big or go home, right? 3. Shaq Washington will become Cincinnati’s all-time leading receiver. This one is not especially bold, but it still calls for Washington to haul in 55 receptions. With 150 for his career, Washington is 54 behind Mardy Gilyard, Ladaris Vann and Dominick Goodman for the all-time lead. This bold prediction is mostly to look smart, but it will probably jinx Washington into not catching a pass this season somehow. 2. Levitcus Payne shows he’s more than just a cool name. Payne had a quality season in 2014 as a hybrid linebacker/defensive back. This season I think he’s going to make a huge leap. There will be a void with new linebackers in the picture. There is opportunity in the secondary to make plays. Payne led the team with 7 break ups; if a couple of those are picks this season, that’s a start. Payne also had a couple of sacks. If he’s fully unleashed on defense, we could be seeing the next Cincinnati defensive playmaker. 1. Cincinnati will go undefeated. Sure, this could be some of the Cincinnati writer talking here, but the way the schedule lays out, it looks like this could be the year for the Bearcats to run the table. The defense doesn’t have to be that much better for the Bearcats to run through their schedule. Going to Memphis and BYU is certainly going to be tough. There are question marks about some of the other games that look like stumbling blocks. Is Temple’s offense going to be better? Will UCF drop off? Can Houston close out Cincinnati? Will East Carolina fall off? The latter two are tough road trips, but they are games the Bearcats should win. This is more of a bet on Cincinnati taking advantage of a relatively weak non-conference schedule and a league with a lot of question marks. I write Bearcats Blog and also on the Student Section.